To attend to our experimental cryoconite holes on a daily basis requires us be close by. 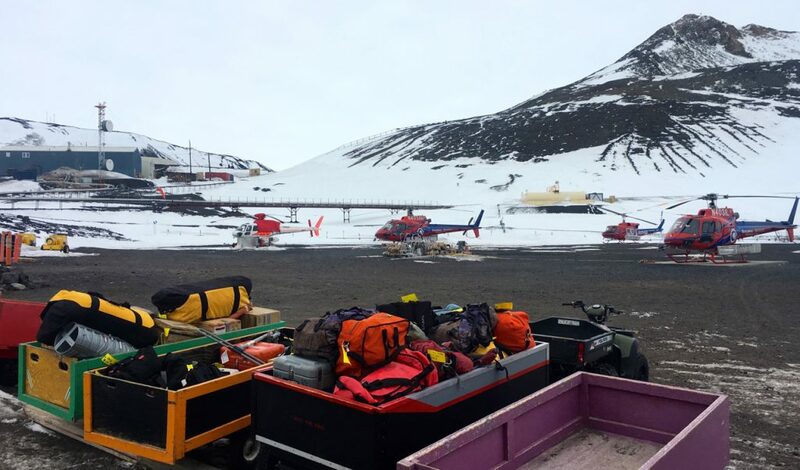 Although McMurdo is just a 40 min helicopter flight away, field trips from the station are never a sure thing because weather can change on a whim. Plus, flying back and forth daily would quickly break the NSF’s bank. 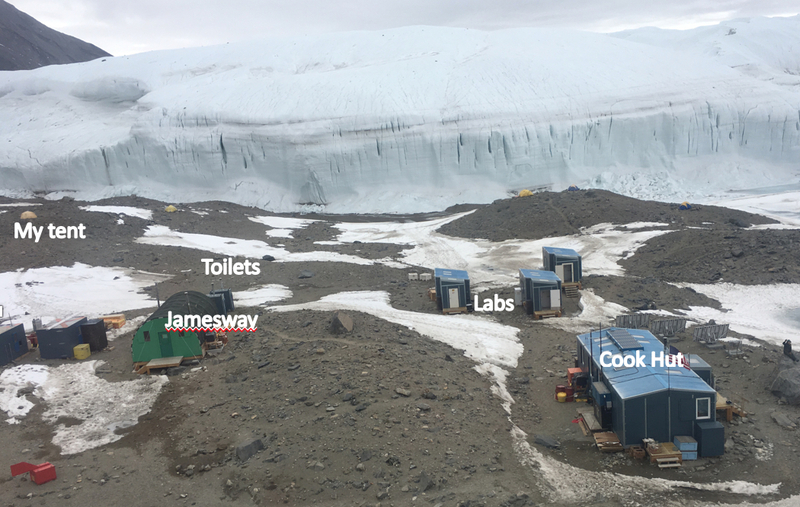 Therefore, instead of living in Mcmurdo, we live in the Lake Hoare camp from where it’s only an hour hike to our experimental cryoconite holes on the top of the Canada Glacier. Cargo waiting to be loaded on a helo for a transport to the Lake Hoare camp. As I already mentioned, we get to the camp by a helicopter. Along with us comes our cargo that not only includes our personal gear (e.g., clothes, tents, and sleep kits) but also all lab and field materials (e.g., sterile bag for sampling of cryoconite holes, laptops, and ice corers). The capacity of field camps can vary from very small and temporary (tents) to more complex and long-term lasting (huts). The Lake Hoare camp consists of several huts: the largest is the cooking hut, three smaller huts are the labs, a jamesway provides for storage, and finally a tool shed and “luxurious” two rocket-toilets. If you noticed, I did not mention any lodging accommodations and that is because we sleep in tents. Currently, the camp has 18 tent sites. The sites we pick and tents we set up become our homes for the time of every field season. Pacifica and Adam will call it home for almost three months this year. But don’t feel sorry for us because we absolutely love it. Every morning I emerge from my tent, I have to pinch myself for the view is always extraordinary. Every night I crawl to my tent, I have to pinch myself for the sound that puts me to sleep is always extra extraordinary. If I “had to complain”, it would have to be about the 24-hours day light. Although the Sun’s highs and lows clearly mark day/night changes, from the inside of the tent it’s a different story. Occasionally, I wake up in the middle of the night convinced its time to get up. To avoid this confusion, I have assumed a simple strategy, I stay tucked in my awesome sleeping bag until my watch alarm goes off. Ever changing but always amazing view from my tent. In the cooking hut we gather to eat, read, work on laptops, or socialize. This year the camp is managed by Anne Beaulauriers who, with help from field assistants sent by the BFC (at the moment it is Krista Koehn), makes sure that all the operations (e.g., helo travel, waste management, and science logistics) run without hiccups. But what we love the most every single day is the food they make for us. 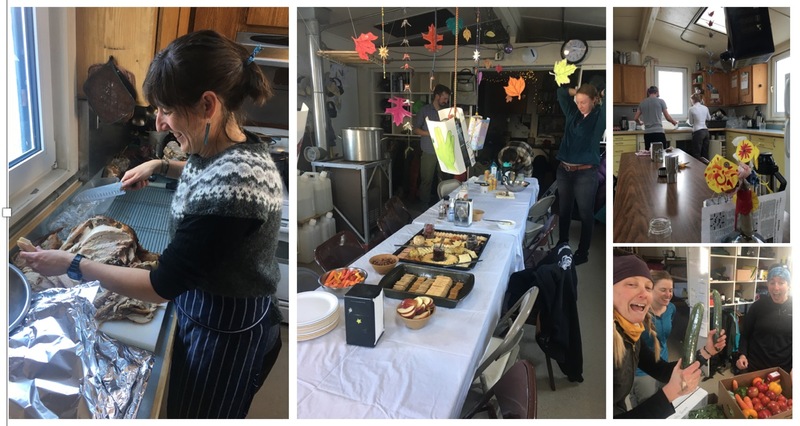 There is nothing better than a smell of fresh-baked pastries early in the morning or a delicious dinner when we come back from a long day in the field working on our cryconite holes project. The cooking hut with Anne slicing her Thanksgiving turkey. Newly delivered freshies make Krista happy! In the labs, we prepare for field days or do the lab work (e.g., filter water samples, calibrate probes). In the Jamesway, we keep our backpacks and gear that we take to the field. This is also where we find some personal space for simple daily hygiene or a once-a week-shower in 2-3 gallons of water (yup, it is possible to shower in this much of water!). This year, we have also been working here on …. pull-ups! Blame (or thank) Adam! He has started it as our team-bonding activity, but slowly it has trickled onto others. Yes, getting stronger together because “together” is the word of this game. Whether we clean up the cooking hut, go collect glacier berries, or march onto the top of the glacier, we depend on each other for company, work, and safety. It’s a beautiful world out here and it gets the best of us daily.